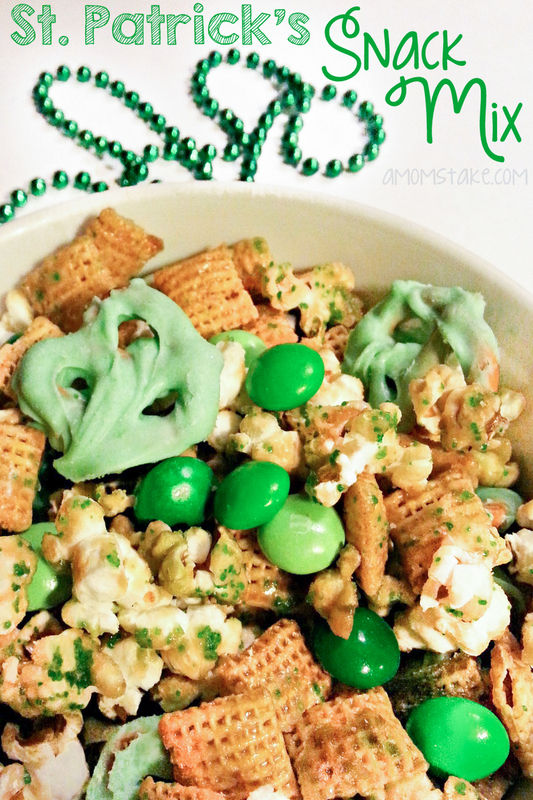 Fun and festive snack mix for St. Patrick's day! In medium heavy bottomed saucepan, melt butter/margarine and brown sugar together. Place waxed paper on baking sheet and spread popped corn and cereal over in even layer. Pour caramel over popped corn and cereal stirring with a wooden spoon to ensure all pieces are coated lightly. Remove from oven and allow them to cool. Gently break apart any clumps that have formed. In a microwave safe bowl, place 4 squares almond bark. Microwave on medium heat in 30 second increments until it has melted. Stir in 2-3 drops green food coloring. Do not use an excess as the added moisture can cause problems in the bark hardening properly after pretzels are dipped. Using skewers or forks, dip each pretzel into melted almond bark coating well. Place dipped pretzels on wax paper to dry and set. Once pretzels have set mix together with popcorn, cereal, and M&M’s.